VK Thiruvananthapuram started its first Swadhyaya Varga on the auspicious occasion of Kalpataru Diwas (01/01/2017), in the premises of VK Thiruvananthapuram. Topic chosen for Swadhyaya is Ishavasya Upanishad. 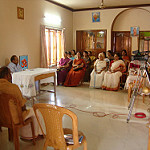 Dr.Murugan, retired Director of Kerala Higher Secondary Board is the Acharya for Swadhyaya. 25 people participated in the Varga which is to held on first and second Sundays of every month. Process for uploading the same in the youtube was also initiated.